Gorge Flyboard – Surf the clouds! 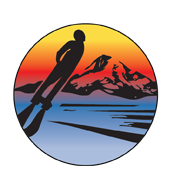 Enjoy a thrilling water sport in a sports enthusiast’s paradise -- the beautiful Columbia River Gorge. You'll fly with the only certified flight school operating in the Gorge. The FlyBoard has positive buoyancy so it floats. There is no speed involved and you’re also well equipped with a life vest, helmet and a wet suit. The helmet is equipped with a microphone and speaker which provides instant two-way communication between you and the instructor. The power to the FlyBoard is controlled by a certified instructor with hundreds of hours of FlyBoarding experience. He knows the correct amount of power needed to lift the flier out of the water and to keep them at a safe height during the flight. He also knows the proper time to cut the power when the flier falls back into the water. Your safety is top priority with us, but that won’t keep you from having an awesome and fun experience. SWIM LIKE A DOLPHIN. SOAR LIKE A BIRD. Our training center provides one-on-one personal training conducted by a mature, certified flight instructor who has taught hundreds of fliers just like you. Thanks to the headset and microphone mounted in your helmet you will receive instant coaching in proper flying techniques. After signing in, you will watch a pre-flight 10 minute video that shows you how to slip on the safety equipment, strap into the board, enter the water, steer while in the taxi position, transition from taxiing to flying position, steer the board during flight, and proper landing and general safety procedures. Then you will apply what you learned in the video. Remember, you are in constant voice contact with the instructor at all times. Most people are out of the water and flying within a few short minutes! To learn more before you fly, click here to visit our Frequently Asked Questions. Learning to operate the FlyBoard is much easier and intuitive than you might think. By Wikipedia definition: A FlyBoard is a type of jetpack/hoverboard which supplies propulsion to drive the FlyBoard through the air and/or water to perform a sport known as FlyBoarding. In the usual water-propelled configuration, a FlyBoard rider (pilot) stands on a board connected by a long hose to a watercraft. Water is forced under pressure to a pair of boots with jet nozzles underneath which provide thrust for the rider to fly up to 15 m (49 ft) in the air or to dive headlong through the water down to 2.5 m (8 ft). The FlyBoard utilizes almost 1,000 gallons of water per minute, at over 60 PSI, with 350 pounds lift to produce an abundance of pure adrenaline pumping, heart pounding, eye catching fun! And no one brings the level of FlyBoard flight excitement quite like we do here at Gorge FlyBoard! The brainchild of French Jet Ski Racer Franky Zapata, the FlyBoard was first developed in the Autumn of 2012. Since then, it has spread worldwide and taken the watersports world by storm. 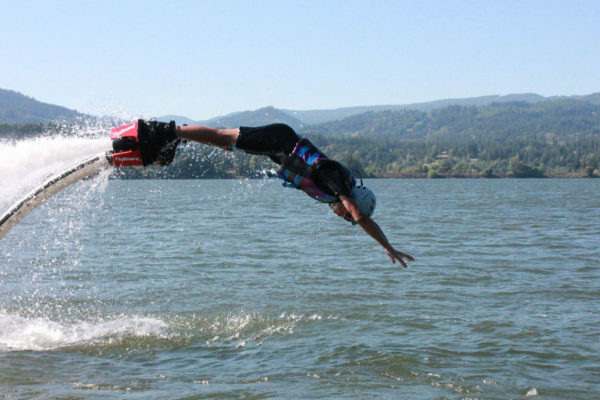 Although some people might refer to it as a water jetpack, the flier is actually secured onto the board with Wakeboard Style Bindings and is being propelled from below, not from your back as the term jetpack might imply. Although the pilot is in complete control of the navigation of the board, the Personal Watercraft (PWC) operator is in control of the throttle thus ensuring safe FlyBoard operation. FlyBoarding is much easier on the body than wakeboarding, tubing or other watersports. You get the most fun possible without the high speed tumbles. Considering the many safety features, research and instructor training put into FlyBoarding, we can assure you that the FlyBoard is very safe and easy to use. This is truly an experience that you don’t want to miss and the best part is that most any able-bodied person can do it and the more you fly the better you become! How does a FlyBoard work? The FlyBoard is a device that is attached to a Personal Watercraft (PWC) via a 65 foot, 4 inch diameter hose. It is powered by the water exiting the PWC pump. The water that is typically used to propel the 900 lb PWC at speeds in excess of 60 MPH is converted to flow through the hose to the FlyBoard. The water’s thrust now propels the FlyBoard pilot through the water and into the air. Although there is a large amount of power available , the first time FlyBoard pilot will only receive enough power from the PWC operator to lift them up to 7 feet above the water. The power will be increased as the skill level increases, ensuring a safe ride for the learning pilot. Learning to operate the FlyBoard is much easier and intuitive than you might think. Once you have applied the instructions given to you, anyone can FlyBoard within the first 5-10 minutes in the water. After only 15-20 minutes you should accomplish full basic control of your movement. A certified FlyBoard instructor sits on the PWC at all time and controls your available propulsion allowing you to gradually build your skill set and confidence. Some people will have a natural ability and a faster learning curve, allowing them to try a few stunts on their first flight. Find your balance and you will be flying like Ironman or swimming through the water like a dolphin. One thing is for sure, you’ll love it and everyone agrees: it’s highly addictive. Learn how the thrill of the sport inspired us to fly with you. The idea for Gorge FlyBoard began in January, 2013 when I saw a YouTube video showing six FlyBoarder pilots simultaneously rising up out of the water and flying 30 to 40 feet into the sky. Then came the spins, turns, dives and other acrobatic tricks and I was hooked. Further research revealed that this was called a FlyBoard and was powered from the thrust created by a Personal Watercraft (PWC or JetSki). Having been an avid water sports guy all my life, waterskiing as a teenager then windsurfing as an adult, I knew this would be a great sport to learn and ultimately teach others. I purchased my new FlyBoard online from the dealer and flew from Maui (our winter home) to Orlando, Florida to learn how to operate it and to receive the necessary instructor training. It was an unusually cool (38 degree) March morning when I arrived at the lake for training. Fog was rising from the lake since the water was much warmer than the air. Although exhausted from a long flight and suffering from jet lag, I was excited (but a little nervous) to get on the water and learn this new sport. After a few falls forward, quite a few falls backwards and some sideways, I finally found the balance point on the board and then there I was standing almost 10′ above the water on the FlyBoard. During this learning process I had taxied to the far side of the lake. My instructor informed me that we needed to return to our starting point and I needed to fly in a forward motion back to the dock where we had begun. I had figured out how to stand on the board but try as I might I could not get my body to lean forward enough to go forward! Eventually, I was instructed to just lay in a prone position in the water and I taxied back to the dock for some much needed rest. When I completed my training I boxed up my new FlyBoard and caught a flight back to Maui’s warm waters where I could log in the hours to complete my training to be a certified FlyBoard instructor. I began taking my friends out and teaching them how to fly. After seeing the “perma smile” on their faces and hearing their positive responses my wife, Sue, and I decided to move to Oregon during the summers to open our own flight instruction school, Gorge FlyBoard, and share the thrills and the adrenaline rush with as many people as we could. We will be entering our fifth season in 2017 and I have taught hundreds how to FlyBoard. It is by far the most rewarding experience of my life. I am fortunate to reside in two of the most beautiful places on earth, 7 months on Maui and 5 months (May to November) in the Columbia River Gorge of Oregon. I have been married for 43 years to my high school sweetheart and we have 3 daughters and 7 grandchildren. I serve on our local fire and EMS department as a volunteer during our time in Oregon. I coached our girls in high school volleyball and basketball which prepared me for my FlyBoard coaching career. During the fall and winter months I operate a home repair and remodeling business on Maui. Get a closer look at first-time flyers and pros soaring through the air above the mighty Columbia River in Hood River and Cascade Locks, OR. Had an amazing time FlyBoarding for the first time ever. The instructor is patient and offers good advice and help. Definitely something I would love to try again. This was my first time trying FlyBoarding and it was so much fun!! The family who runs the business is very accommodating and friendly. I would say everyone should and could do this! The 30 mins goes by fast so an hour would be ideal, my friends will definitely do this again! We loved every second. Neil was so patient and encouraging as he taught us how to FlyBoard. He was laughing along with us, like a friend, during our falls. My 16 year old son picked it up quickly and Neil instructed him in some more difficult maneuvers with the same patience he started with. I would recommend this to everyone- of all athletic and balance abilities. It really is doable when someone like Neil is teaching. We had an absolutely great time, very friendly and relaxed in instruction and the experience is a blast. Thank you! 1st Timers! Both my 2 children (Son 16 / Daughter 17) and I had an amazing experience FLYBOARDING!!!! Neil was a great teacher and provided a very safe environment! We had the time of our lives!!! Thank you! My 15 year old boys had a blast!! Instructor was very helpful and patient. Had a little time crunch to getting there and was very impressed that they went out of their way to accommodate! Definitely plan to try myself! Thanks again. What a blast! Neil was great to work with, explained the equipment well and genuinely enjoyed sharing the sport with others. A must-do for anyone adventurous.